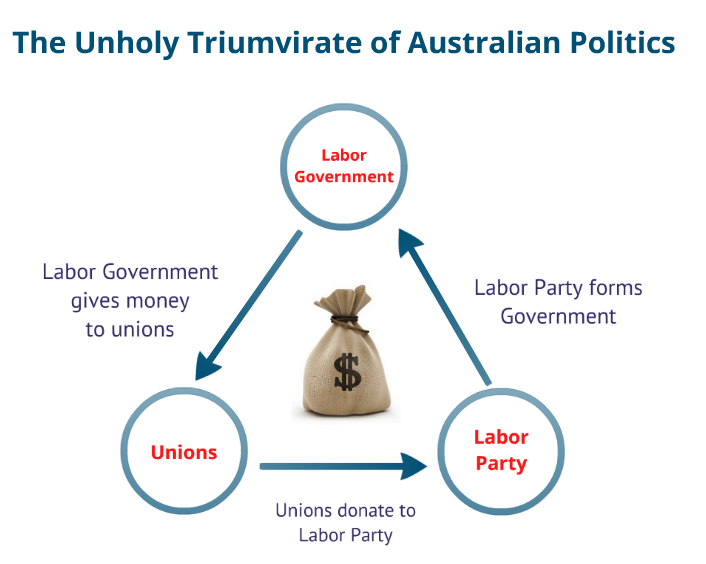 In my recent post “The Unholy Triumvirate of Australian Politics” I developed a nice little diagram highlighting the money-go-round that is the relationship between Unions, the Labor Party, and finally Labor Governments. Well that view has been completely affirmed by John Ferguson in The Australian just a few days ago in his article Militant union underpins ALP, which again is behind Evil Rupert’s Evil Paywall™ so I will summarise for those of you that don’t pay for the news you consume. The Construction Forestry Mining and Energy Union (CFMEU) is one of Australia’s largest and most militant unions, and it turns out that this militant union is seriously underwriting the Labor party. This really shouldnt come as that much of a surprise because the CFMEU has been publically backed by the ALP here in Victoria, but what is surprising is the level of financial support that the CFMEU and indeed the union movement in general contributes to the Labor party. As the graphic shows, the CFMEU has contributed $9.1 Million since 2001 towards the Labor party, second only to the extremely powerful Shoppies Union. That is some serious amount of money going in the front door of the Labor party. What irked me was not only that I basically had no choice but to join the union, but also because I had no say whatsoever in what donations were made by my union in my name. I know of many other people who find themselves in similar positions and almost to the man these people just sign up because they cant be bothered with the bully tactics that union members use to intimidate non-union members. This is why legislation introduced in NSW to prohibit political contributions to only individuals is a step in the right direction. Of course this was quite necessary in NSW due to the completely corrupt influence of unions and Labor party members on critical decisions such as the granting of million dollar coal exploration licences and looking at this research it would appear that something similar is needed here in Victoria. However, I wonder what the response would be if Victoria followed NSW’s lead and banned political donations from organisations and instead insisted that only individual people could make donations? I would imagine their response would not be a quiet nor meek stroll through the CBD. Interestingly, this legislation is currently being appealed in NSW by… you guessed it, the Unions. The only Union that is missing from the list of contributors is the AWU, but I suppose that they probably feel that they have donated enough in the past either in actual funds or in kind. Like not pressing charges when a supposedly “young and naive” lawyer helped rip off several hundreds of thousand dollars out of their pockets.